Our Family Style Rooms are traditional hotel-style rooms that feature two queen size beds and a private bath. We have 24 family style rooms available. Standard rate is $89 per night + tax. Our Monastic Style Rooms feature two bunked twin beds with in room sink and a common bath down the hall. These rooms are located near a family style kitchen with two refrigerators and a stove, equipped with coffee pot and dishes for guest use. Standard rate is $44 per night + tax. 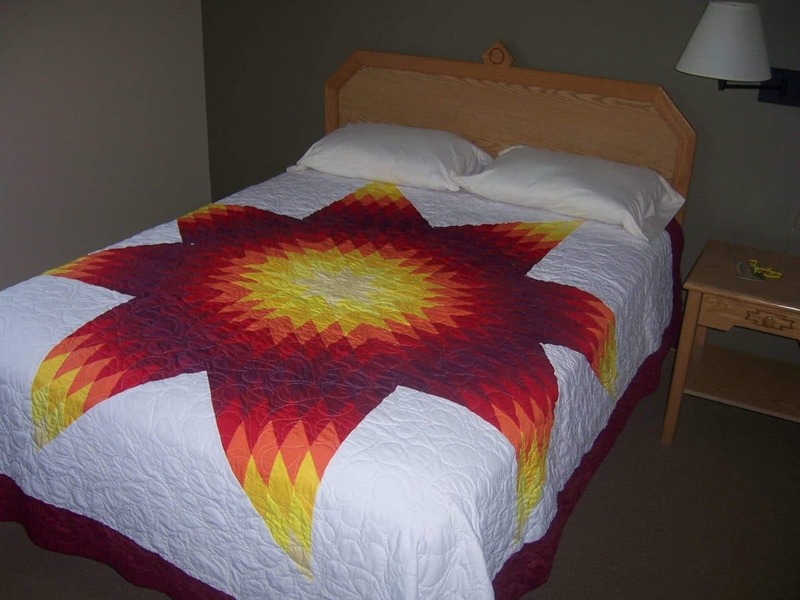 All linens are provided and each bed features a beautiful, hand-made quilt donated to the retreat center. If you’re traveling with a religious group OR staying with us for a Diocese of Rapid City event, please contact us for a COUPON code to get discounted lodging. A residential kitchen is available for all lodging guests to use. The kitchen is stocked with pots, pans, plates and more! A small patio is located just outside the kitchen. Guests are also welcome to use a small reading library – all materials have been donated.